Only a fifth of IT decision makers in large multinational corporations are confident that their organisation is fully prepared against the threat of cyber-criminals. The vast majority of companies feel constrained by regulation, available resources and a dependence on third parties when responding to attacks, according to new research from BT and KPMG. The report, Taking the Offensive – Working together to disrupt digital crime finds that, while 94 per cent of IT decision makers are aware that criminal entrepreneurs are blackmailing and bribing employees to gain access to organisations, roughly half (47 per cent) admit that they don’t have a strategy in place to prevent it. The report also finds that 97 per cent of respondents experienced a cyber-attack, with half of them reporting an increase in the last two years. At the same time, 91 per cent of respondents believe they face obstacles in defending against digital attack, with many citing regulatory obstacles, and 44 per cent being concerned about the dependence on third parties for aspects of their response. The BT-KPMG report shows that Chief Digital Risk Officers (CDROs) are now being appointed to hold strategic roles which combine digital expertise with high-level management skills. With 26 per cent of respondents confirming that a CDRO has already been appointed, the report’s data suggests that the security role and accountability for it is being re-examined. The research also flags the need for budgets to be adjusted, with 60 per cent of decision makers reporting that their organisation’s cyber security is currently financed by the central IT budget while half of those (50 per cent) think it should come from a separate security budget. One major challenge identified by the report is the funding and scale of R&D spending that the criminals can bring to bear on breaching the defences of target companies. 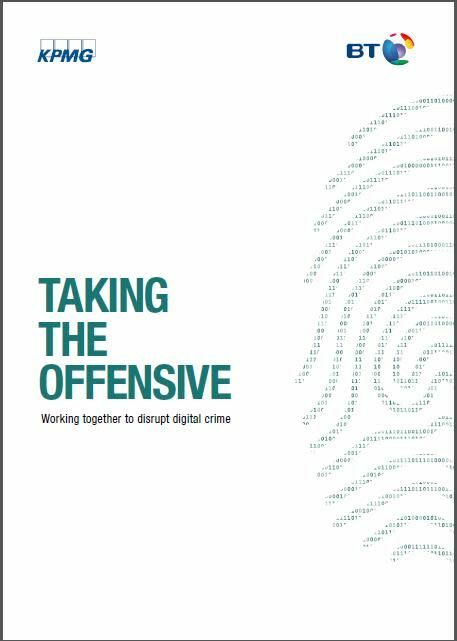 The “Taking the Offensive – Working together to disrupt digital crime” extensively quotes a number of security directors of well-known global organisations and lists examples of the many forms of criminal attacks encountered by global organisations, including various types of malware or phishing attacks. It also describes the business models favoured by the criminals and the black market behind them, whether they carry out high-end targeted assaults on the finance system or regular attacks on businesses and high net worth individuals, or even the commoditised attacks affecting all of us. The conclusions of the research point to the need to change mindset and to regard security not simply as a defence exercise. It is, in fact, the enabler that facilitates digital innovation and ultimately drives profit. BT and KPMG are now engaging with large organisations around the world to debate the learning points of their joint research and advise on the changes that need to be undertaken. The report is available for download on bt.com/taking-the-offensive.